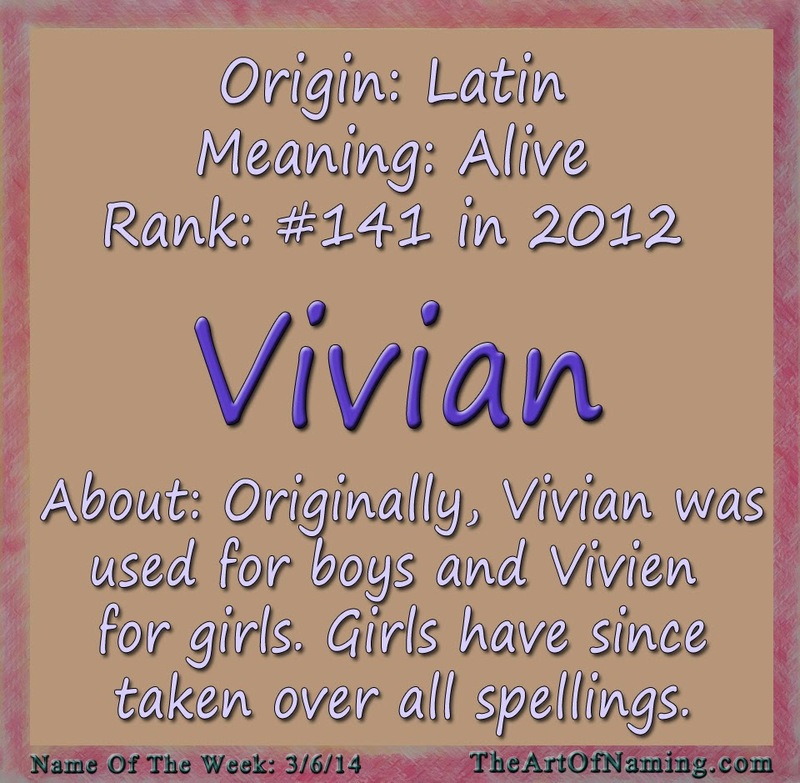 Vivian is a vintage name that is currently popular for girls again. Since the middle ages, Vivian has also been used for males. 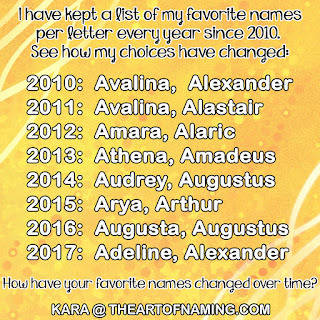 Especially in modern times (or at least since 1880 in the US), this name is predominantly female despite the name still being given to boys here and there. The name Vivian comes from the Latin name Vivianus which was taken from the Latin word vivus which means "alive". However, as a feminine name, Vivian is also said to be an Anglicized form of the name Bébinn which means "fair lady" in Irish Gaelic. This form has been used by several women in Irish mythology including the goddess of childbirth. The spelling Vivien was first used by Alfred Lord Tennyson in his epic Idylls of the King in 1859. It is said that he either based it on Vivienne, (which is the French form of Viviana which comes from Vivian), or it could have been a misreading of Ninian. However, the theory that Ninian leads to Vivian is uncertain. Click here to view the different family trees and possible origins of these names. Somewhere around 1911 the name Vivian skyrocketed in popularity for girls. 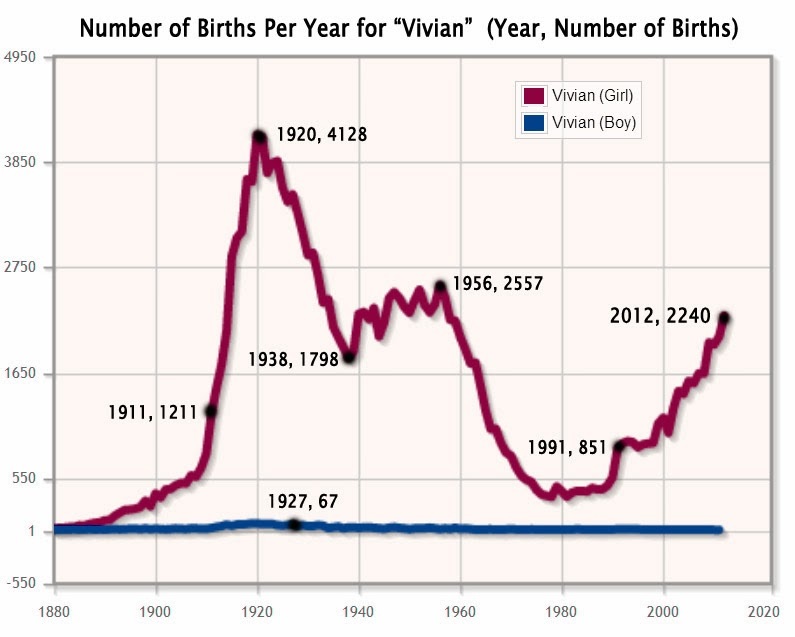 Vivian hit her popularity peak in 1920 with 4,128 births. It wasn't until the 1960s that this name began to lose its momentum, falling back to the same low levels previously seen pre-1911. Then suddenly, parents of the late 1990s and early 2000s began to see this name with fresh eyes! By the latest records, 2012, Vivian was halfway back to her former levels of glory with 2,240 births for the year and an impressive ranking of #141. I suspect that this name will only climb higher as per the 100-year rule and hit a new peak somewhere before or around 2020. The name Vivien is not currently ranked in the Top 1000. For a girl, it only had 189 births in 2012. This is the spelling used by Old Hollywood actress Vivien Leigh of Gone with the Wind fame. However, the French Vivienne is gaining popularity every year. She had 978 births in 2012 for a ranking of #322. Lovely Viviana ranked #478 in 2012 with 637 births while counterpart Vivianna had 156 births and did not rank in the top 1000. Which form of Vivian do you like the best? What would you pair with Vivian? To me, Vivian still seems the teensiest bit masculine, so I would only pair it with ultra-feminine names. I must say, I almost never see anyone named Vivian, but I do see Vivienne a bit.